Melissa Bommarito read a book to her sons, 18-month-old Lucas and 3-year-old Henry, before Mass at St. Catherine Laboure Parish. A few minutes before the noon start of a recent Sunday Mass, Henry Bommarito wanted to pick up a little something for his younger brother, Lucas, to help him pass time at Mass. Henry has enjoyed the goodies, and it was only natural for his brother to do likewise. By the way, Henry is 3; his brother just 18 months. In the “Gathering Space” at St. Catherine Laboure Church, Henry briskly entered the area in which “Children’s Church Bags” for ages 6-and-under hang from kid-height coat hooks … except the hooks were a smidgen too tall for him. On tippy-toes, he tugged and pulled and pulled and tugged but, try as he might, a bag remained elusive, its handles well-hooked. Then, his Mom, Melissa, lent a hand and unhooked one. Henry proudly slung the bag over his shoulder and marched into the sanctuary as Father Jim Cormack, CM, and the servers processed down the center aisle. Once in place at the altar, Father Cormack encouraged the congregation to greet the people around them, in a gesture of welcome before the start of Mass — a sign of peace, as it were, about a half-hour before the official offering in Mass following the Lord’s Prayer. 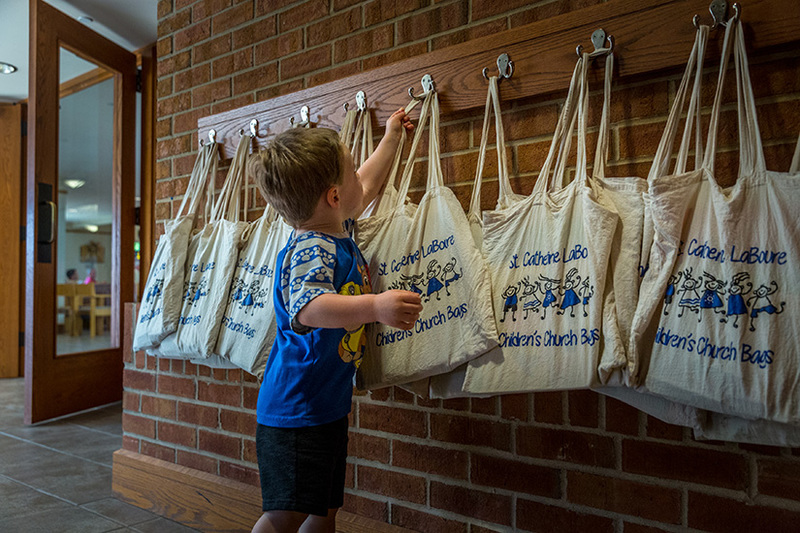 The “Children’s Church Bag” and the pre-Mass greeting are simple things that describe St. Catherine Laboure Parish in a nutshell: warm and welcoming to people of all ages — young and old and all ages in between. The Children’s Church Bag includes a coloring page based on the Sunday readings, crayons and a religious book. So, the little ones get a little catechesis with their entertainment, but that’s just a start. The parish also hosts a monthly children’s liturgy in which PSR and parish school students help with planning; a weekly Liturgy of the Word for students in first through fourth grades and Sunday school for 3- to 5-year-olds to learn about about the Scripture readings. Henry Bommarito reached for a Children’s Church Bag at St. Catherine Laboure Parish. The parish offers the bags as part of an effort to be more welcoming to families with children. Another big addition has been the subtraction of a figurative “not welcome” sign: the so-called “cry room,” from which parents might get the message that potential unruly children aren’t welcome in church. The old cry room has been converted to a storage closet for the building dedicated by Cardinal John J. Carberry in 1975 and renovated in 2008 with the gathering space and improvements within. Glass plays a big role in the redesign. Minimal stained-glass windows made for a dark sanctuary, but the windows now are about three times larger, bathing the sanctuary in natural light. (The small stained-glass windows remain.) Also, before the renovation, wall and doors blocked the view from the outside looking in. Now, with huge glass doors and windows between the gathering space and sanctuary, parents see and hear the Mass from piped-in speakers while children work off a little energy before tuckering out and returning to Mass. To drive home that fact, the parish regularly baptizes babies at Sunday Masses, with Father Cormack explaining the ritual as it happens. Parents and godparents have seats of honor right next to the altar. From moment of the baptism, the babies are full members of the parish community, growing up not only learning the Catholic faith but the charism of St. Vincent de Paul of service to the poor. A Vincentian parish, St. Catherine Laboure, which is in the Sappington area of south St. Louis County, often supplies volunteers to St. Vincent Parish Downtown. Father Cormack also was a pastor there. St. Catherine Laboure is among the largest parishes in the diocese, with 6,514 parishioners (among 2,260 households), which is 13th of 180 parishes in the archdiocese. It also had 72 baptisms in 2017, seventh in the archdiocese.